I know you guys have heard me say, “Design rules, what rules?”. So, this post must seem like a total contradiction, I know. But, there are definitely some decorating mistakes you should avoid. Let me first start off by saying that this is just my opinion, meaning if you think your home already looks awesome, you can just ignore me. Your home looks, simply stated – OFF? Many people will probably disagree with this one, but the bath rugs that are shaped to fit the base of a toilet are a NO-NO. It’s a dated look that is slowly (too slowly) phasing out. Not only that, they’re also pretty gross. Instead, opt for a nice rug on the outside of the shower and/or the sink base, if needed. Bottom line – don’t use these rugs, please. Ever. Decorating Mistake #2 – Filling a room with “Dollar Store” accessories or furniture. If you decorate with only Dollar Store accessories or furniture, that’s what your home would look like: a Dollar Store. There’s nothing wrong with grabbing a cute, functional item from a Dollar Store, but when you exclusively shop at the Dollar Stores for the decor, you’ll have a home that looks cheap and predictable. If you want help with decorating on a budget, check out my services, view my portfolio, or contact me. 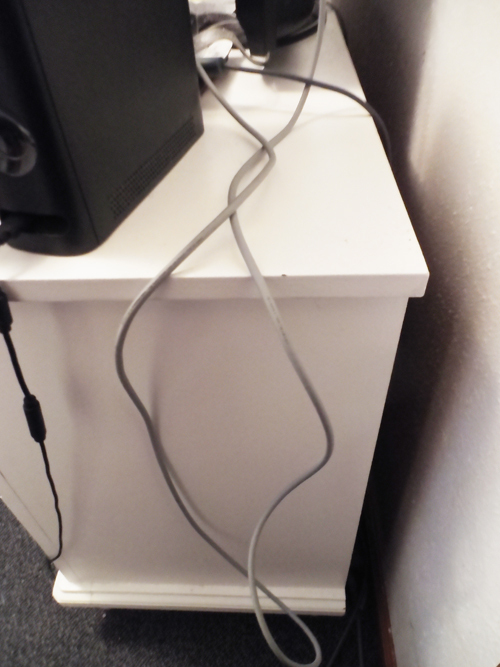 Decorating Mistake #3 – Exposed wires. Don’t leave your TV and component wires exposed. Find a way to hide them behind components, or if the budget allows, in the walls. You can also get decorative cord covers. 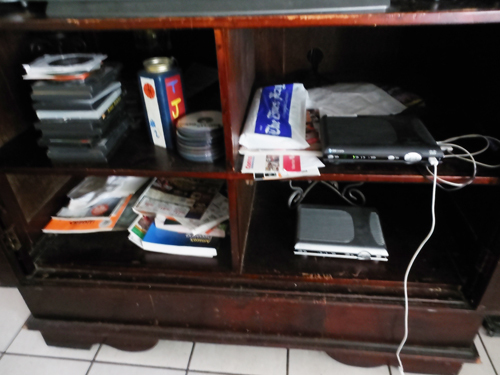 There are plenty of ways to hide your cords and wires and a lot of different products made to help keep them hidden and organized. Decorating Mistake #4 – Poorly themed rooms (hawaiian, sports, beachy, etc.). Sometimes this can work. If you’re going to do a theme, try to go more broad, like Nautical, instead of an isolated them, like Seashells (or go with Safari, instead of Zebra). To make a decorating theme work, try working with the colors and style of a theme, opposed to characters and an overload of art related to the theme. For example, if you love Paris, don’t decorate your room with cheesy store bought items that say “Paris” or have the Eiffel Tower on them. How about going with a Global/Travel theme, opposed to a “Paris” them, and use some vintage Paris what-nots (try antique shops and flea markets) and spreading them (moderately) throughout the room. If you’ve actually been to Paris, you can use items from your travels. Maybe use the color scheme from an amazing photo you took while you were there. For furniture, you can use suitcases as side tables and art could be a world map, pictures of different places you’ve been, etc. Decorating Mistake #5 – Cheap, outdated accessories, hardware, and lighting fixtures. By not updating dated accessories and hardware, your home would remain in an outdated state. Changing hardware and lighting can be very affordable. There are really cool, inexpensive selections available in many different stores. If you already have a beautiful, vintage light fixture that adds to the appeal of your decor, then of course no change is needed. Decorating Mistake #6 – Too many heavy furniture pieces or too many light furniture pieces. You want to make sure there’s balance in your furniture pieces. If not, your room looks a bit Alice In Wonderland-y. If you have massive furniture, I’m not saying that you should mix in a teeny ottoman, but you can go with medium scale living chairs (for example). Combat clutter by removing what isn’t needed and using decorative baskets and boxes to hide and organize items that you need to keep. Decorating Mistake #8 – Furniture that doesn’t fit. Yes, that sectional sofa can fit all 10 of your girlfriends, but if it spans wall to wall in your room, it shouldn’t be there (unless it’s some sort of man cave or mom cave that’s meant for lounging). A general rule of thumb to access if a sofa is too large for a small room: you should have enough space leftover to at least put a side table on each side of the sofa.In order to have a well decorated space, furniture should look as they were made to fit in your space(s). The same goes for chairs, coffee tables, and any other furniture. If it looks like there’s no way that piece was able to fit through the doors in your home, then it’s probably too large for the room. Decorating Mistake #9 – Placing all your furniture along the walls. If possible, pull your furniture away from the walls and in the center of your room. Many times if you have one sofa against a wall and another across from on the opposite wall, the sofas aren’t close enough for a comfortable conversation. Floating furniture makes a room feel cozier and can help define a space, especially in an open concept floor plan. Decorating Mistake #10 – Fake (faux) flowers that look too fake. Don’t decorate your home with cheap, dollar store, faux plants. They make your home look dated. If you’re concerned about having real plants and flowers, try succulents – they’re hard to kill and look great. Orchids are also really hardy and beautiful. Bring in greenery from outside your home, like tree cuttings or flowers from your yard. Go out and snip a few branches and put it in a vase. If you must have faux plants (maybe you’re allergic to real ones), make sure the plants are silk, they look much more realistic than the plastic plants. Try these from Wayfair. 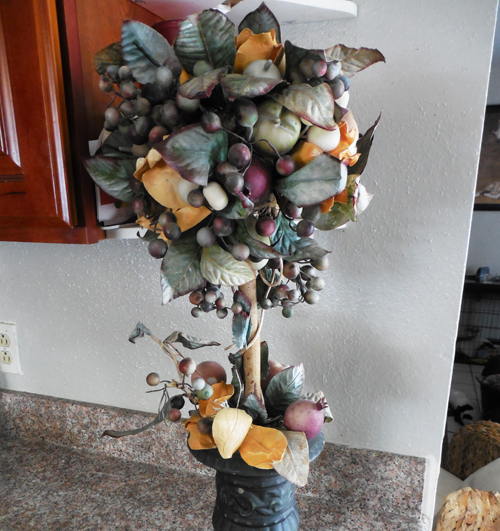 Faux floral arrangements like these look fake and attract dust. I know a lot of people won’t agree that these are “bad” when decorating, but I assure you, if you avoid these decorating mistakes, your space would feel a lot fresher. Like I mentioned before, these are my opinions and from my experience, these mistakes make a home look dated, cluttered, and cheesy. If you love to do either of the above, please don’t change a thing. You guys know I’m only here to help! So, tell me, which one of these decor mistakes are you making in your home? Do you agree/disagree with any of them? Kristen, LOL! I can understand that. But, there could be another solution, you can still go with a rectangular that scoots up to the toilet (if that works). Oh my heavens YES. All of these things! Haha. Especially the faux flowers! I absolutely loathe fake flowers. Yuck. I’m a little iffy on the toilet rug one though, gotta be honest. I have a really awesome one from Bed Bath and Beyond…not one of those yucky carpet-y ones. It’s like walking on a cloud! Plus our toilet is right by the tub so it’s nice to step onto a rug and not the cold tile! Catherine @ Happily Ever Crafter recently posted…1st Blogiversary! Celebrating with a GIVEAWAY! I’ve seen some really, really cute toilet rugs in Target. Sometimes, they could work, especially if it’s the only rug in the room. These seem to be very good recommendations! I know for sure that I don’t do at least one….#1…whew! 🙂 Thanks for some great guidelines! You’re welcome, Joy! Thanks for visiting! Lawd I am guilty of the first one I have them throughout all 3 of my toilets lol. I am no decorator actually my hubs does a better job so I leave him to it. I do have to do something with all these chords hanging around. Baby steps, Kita! The cords are an easy fix. There’s so many decorative cord covers! I agree with it all! I pretty much always have a tape measure with me because furniture that looks like the perfect fit in a warehouse type setting can overpower a smaller space inside the home. I read a great blog post the other day stating how the author got rid of all of her fake plastic fall decorations and went outside and brought nature inside. There is nothing I hate worse than fake flowers! I keep a tape measure on me always, too, Alli!! You never know when you’ll find that “perfect” piece, so you have to make sure it’ll fit in the area you’re working with. Why no toilet bath rugs?! *sigh* I have one in my daughter’s bathroom but in my other two I dont. I dont feel so bad. Toilet bath rugs are dated decor (my opinion). 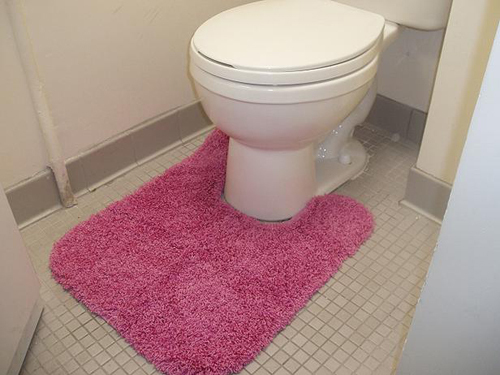 If you love your bathroom with your toilet rug, then that’s great. It’s really your choice, because you want your spaces to be comfortable for you! Many times, when people are updating their bathroom, the toilet rugs are the first to go, it definitely makes a room feel more updated. Bathroom rugs are not just out but also yucky, I think. I remember a time where everyone had them, you were out Not having them. I always trued to stay away from them, out or not. Yes, Anna!! That’s one of my personal issues with the bathroom rugs! I agree with everything but would make it a list of 13. Adding that furniture on an angle has to go, putting bedroom furniture in front of a window because you insist on owing a 200 year old house AND a california king bed, and the last thing is to stop puddling your drapes. It’s funny that you mention the furniture on an angle, because I just saw a photo of a living room on Houzz with the sofa on an angle. I usually hate the look (just a personal opinion), but this living room on Houzz was beautiful. Thanks for the extra “no-nos”! Oh but I hate for my feet to touch the floor. I’m barefoot in the house 90% of the time. My name is Kenya G. Johnson and I have toilet rugs. LOL, thanks for commenting Kenya!! I’m laughing so hard at these tips because I agree with them all. ESPECIALLY #1 and #10. OMG no. OMG….the toilette rug is a pet peeve of mine. Gross. This is a great post.